Way back in 1984, I was inspired by my love of walking in the Pyrenees to start a company sharing my knowledge and enjoyment with others. I named the company after the warm breeze that blows up from the south – from the Sahara in fact – that gives us such a unique climate making the Pyrenees both warm and green. And now we help over 13,000 people every year to enjoy walking and cycling holidays in the Pyrenees, and in other equally beautiful and unspoilt parts of the world. While I am French and a Pyrenean through and through, I have always had, as you say, a soft spot for Britain, and worked there while learning English. So I am delighted that we are now launching a proper English language holiday programme with itineraries, accommodation, transfers and packages designed exclusively for the worldwide English speaking market. 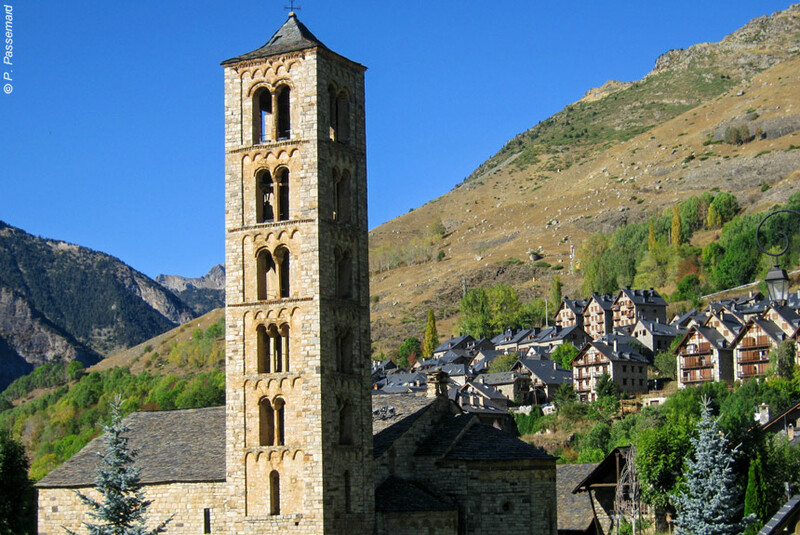 One of the major differences is this: many English speakers may visit the Pyrenees only once, so we have packed as many highlights into each itinerary as we can. You visit iconic places every day, and stay in truly authentic hotels enjoying some of the best cuisine in France. So if you ask who we are, we are Pyreneans – and you can be sure we will do everything in our powers to give you the best possible experience of our homeland. As people say these days, ENJOY ! Probably the best "lakes and mountains" walking holiday in Europe. More lakes. More high mountains. More ancient footpaths. More attractive villages. More authentic cuisine and stylish accommodation. The sunny Catalan Pyrenees awaits you! The region of the Italian Lakes has five major lakes. Britain's Lake District has less than 30 lakes, tarns and reservoirs. Spain's Encantats Lakeland has over 300, and on this holiday you can walk past and/or see at least 100. What's more, it is a dramatically beautiful region, and the lakes, with their crystal clear waters, reflect the sunshine, blue skies, high mountain peaks and deep green forests that typify this region - largely undiscovered by foreign visitors but granted iconic, almost sacred, status by Spaniards. If you like lakes and mountains, you will love this. If you also like ancient footpaths, typical villages, historic churches, wonderful cuisine and a warm welcome then you will adore this region. This itinerary includes daily private transfers to enable you to only walk the "best bits". Inevitably, this adds to the holiday cost, so the overall price cannot be directly compared with apparently similar holidays. Standard option: You make your own way to Salardù in your own car. You will be able to use it for walk transfers on day 2 (but not all days because some of the dirt tracks are restricted to taxis only). With extra airport pick-up: We will pick you up at Toulouse aiport of railway station and take you to Salardù. Salardù is located in the beautiful Aran valley, on the Spanish side of the border. You stay for the first three nights in Salardu because it is at the very centre of endless wonderful walks in the Encantats Lakeland - as you will discover! You stay at the welcoming Hôtel Deth Pais (it means Country Hotel in the local Aranese language - different to Spanish or Catalan), which combines the best of traditional values and modern facilities. It also makes the best of its admirable location: in the high altitude village of Salardu right next to one of the most renowned 13th century Romanesque churches (wonderful paintings and sculpture), and facing, across the valley, the highest mountain in the whole of the Pyrenees, the 11,000 feet Aneto, as well as having lovely views down the Aran valley. We are confident you will really enjoy your dinner, and the good breakfast here. 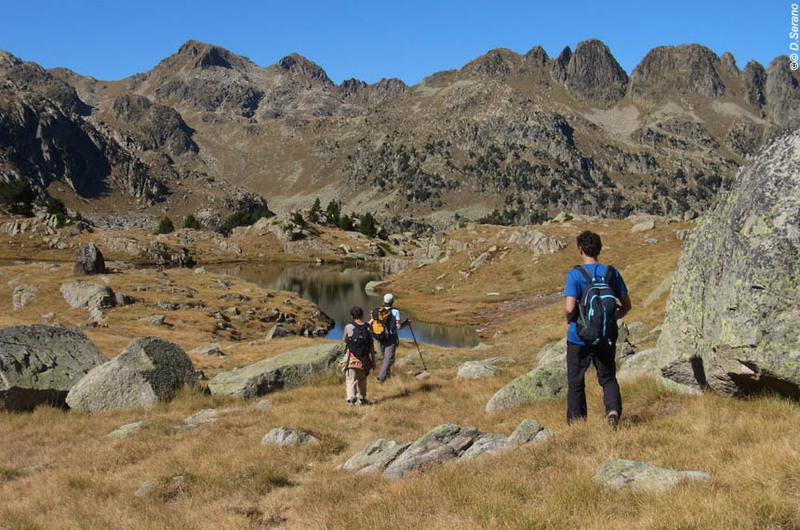 Your first walk is a circular one that enables you to begin to appreciate the majesty of this Pyrenean Lakeland, while keeping an eye out for the Pyrenean chamois (more goat than deer in its behaviour), and, overhead, a variety of eagles and birds of prey, not least the magnificent Griffon Vultures. 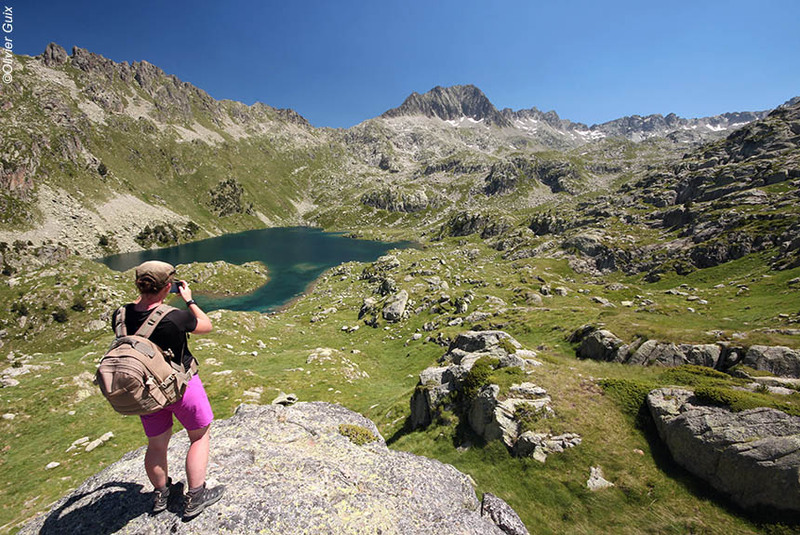 There is a short transfer so your walk can begin on the lovely Beret plateau (close the celebrated ski resort of Baqueira-Beret) with a gentle walk through narrow granite valleys and pine forests before the landscape opens out into large glacial "amphitheatre" where you will find the first Baciver lakes. You follow a looping path that passes several lakes, almost all ridiculously photogenic, and gradually climbs to the Tuc de Rosari where you have unforgettably panoramic views across the Encantats "massif" to the magnificent Aneto itself. You can take a longer route, or simply descend by another path to the Beret plateau, and Salardu. A great start, we promise! For your second night in Salardu, you stay at the Hôtel Deth Pais, but eat in a very good village restaurant. If you have your own car, you can use it for today's transfer. Walking time : 4h30 or 6h. Distance : 9,5km or 12,5km. Elevation : + 500m or + 800m / - 500m or - 800m. Transfer time : 15 minutes. Today there is a spectacular drive up to the beginning of the justly famous Colomers valley. You will enjoy the magnificent circular path that passes close to 50 (yes fifty) lakes - some admittedly more ponds than lakes, but the banks of some resembling artistically landscaped gardens rather than the entirely natural places they actually are. The often emerald coloured waters reflect the surrounding alpine meadows, pine trees and mountains, but the scenery is constantly changing with delightful surprises around almost every corner. For those of us used to visiting just one lake, it is an almost overwhelming experience to see so many lovely lakes, especially with so very few other people around, and no coaches or souvenir shops! For your final night in Salardu, you stay at the Hôtel Deth Pais again. Walking time : 5h. Distance : 11,5km. Elevation : + 450m / - 650m. Transfer time : 35 minutes. We begin the day by transferring you to the Ruda valley (4x4 taxi necessary) so that you can explore the numerous lakes of the Saboredo valley, gradually climbing up to the 8,398 feet col at Ratera d'Espot (but remember that you start at somewhere around 5,000 feet so the climb is not that great!). Here there is a small mountain refuge of Saboredo where they serve food at lunchtime, and drinks at other times. You now make a short descent by a mountain "balcony" path to the wonderfully located refuge d'Amitges where you will spend a truly unforgettable night in the heart of the Pyrenees. For many this is the highlight of the journey. The large, stone built refuge could not be better located: beside a lake with the San Maurici valley and numerous lakes below, and the magnificent granite peaks around you - and over which the sun rises. Whether you are up in time to see that depends entirely on you, but we would certainly recommend it. Life in a mountain refuge is relaxed, friendly and communal. You sleep in a dormitory, share the private bathrooms (hot showers), eat at communal long tables, and will almost certainly enjoy meeting a wide range of interesting people - from millionaire bankers to impecunious adventurers, from super-fit 25 year olds to grizzled walkers well into their 70s! Walking time : 5 to 6h. Distance : 11km. Elevation : + 900m / - 200m. Transfer time : 45 minutes. Sadly (we expect! ), you will leave the refuge, but will soon recover your spirits as you walk down a hidden valley with tumbling streams and crystal-clear waterfalls more populated with deer than people, and arrive at the heart of the Aiguestortes and San Maurici Lake National Park - little known outside Spain, but an iconic, almost sacred, must-visit destination for the Spanish. You will experience for yourself just why that is the case. You take a superb path above San Maurici lake with magnificent views of the famous twin peaks dominating it, and arrive at the Portarro d'Espot col at more than 7,000 feet - and the crossroads right at the heart of the Encantats. Your camera might just be used here before you gently descend to the gorgeous Lake Long ( the most attractive one in the region?) then through meadows and forests beside the "tortuous waters" of the Aiguestortes river itself, which gradually calms and meanders as it reaches the valley floor. We collect you to avoid the short but tiring (at the end of a great day's) walk to the village of Erill la Vall. For some technical reason, the charming, recently refurbished and simply delightful chalet style Hôtel l'Aüt is a one star hotel, despite having an attractive restaurant (with good regional cuisine), beautifully refurbished en suite bedrooms featuring local stone and wood, and in a great location in the pretty, medieval village of Erill la Vall - and a few steps away from the famous Romanesque church of Santa Eulalia. We like it a lot. Walking time : 5h. Distance : 12km. Elevation : + 300m / - 850m. Transfer time : 40 minutes. Erill la Vall is in the heart of the Boi valley, renowned for its Romanesque churches, and today you take a circular walk that takes in all its highlights: the ancient footpaths; the village of Boi with its remarkable stone houses, and restored frescoes in Sant Joan church; the lovely village of Taüll with its 2 churches, Sant Climent being the most famous in the whole region because of its bell tower and superbly restored frescoes; a return walk beside a picture book stream - and the option of taking a "balcony" path up to the village of Durro. You stay a second night at the Hôtel l'Aüt appreciating its well earned comforts and cuisine. Walking time : 4h or 5h30. Distance : 9km or 14km. Elevation : + 500m or + 700m / - 500m or - 700m. Today begins with a short taxi transfer to the bottom of the valley, and the man-made, but nonetheless attractive, Cavallers lake with the surrounding granite mountains (popular with climbers) reflected in its crystal clear waters. You walk up from there to the stone built refuge at Ventosa y Calvell, beautifully situated on a rocky spur above the Black Lake, which usually is not black at all, and neither are the mountains rising all around it, including the impressive 9,000 feet plus Besiberris range. 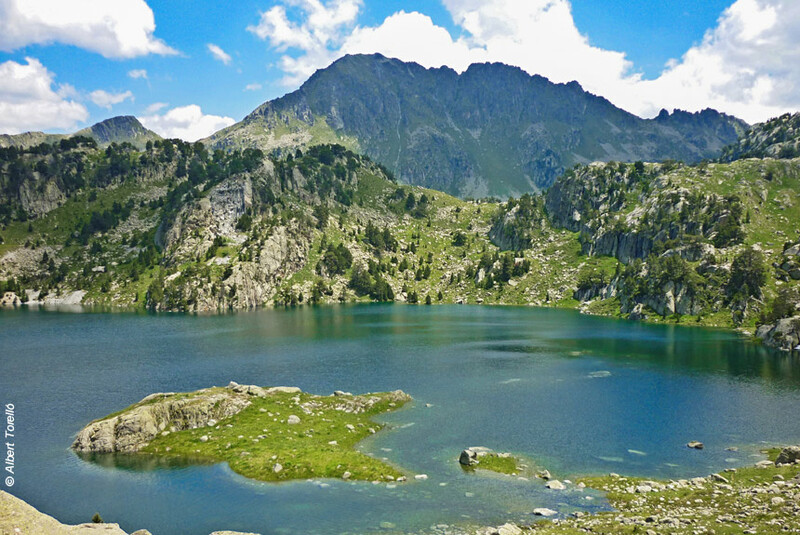 In fact, you will probably be walking in glorious sunshine across a lovely plateau that features the Travessani lakes before reaching the col de Crestada, and descending past numerous other high altitude lakes to arrive at the Restanca refuge. The pick-up point is just a little further down the hill, from where we will drive you to Veilha. Alternatively, there is a shorter walking option returning to the Cavallers lake, but resulting in a longer transfer. Standard option: At the end of your walk you will have a transfer back to Salardù to collect your car. You then have just a 7-mile drive to your last night's hotel in Vielha. This way you will be free to leave when you want the following morning. With extra airport pick-up: At the end of your walk you will be taken directly to the hotel in Vielha. Hôtel Riu Nere is a stone building well situated in the pedestrianised zone in the centre of the old village. It has been designer refurbished with style, and a lot of wonderful local timber. The restaurant offers high quality regional gastronomy, but you might also want to wander the streets in search of a plate of tapas or two. A fine end to your journey anyway. Walking time : 4h or 6h. Distance : 8km or 11,5km. Elevation : + 500m or + 700m / - 500m or - 850m. Transfer time : 30 minutes or 1h15. Standard option: Your holiday ends after breakfast. With extra airport transfer: We will pick you up from your hotel after breakfast and transfer you back to Toulouse airport of railway station. Standard option: You make your own way to Salardù in your own car. You will be able to use it for walk transfers on some days (but not all days because some of the dirt tracks are restricted to taxis only). Standard option: Your holiday ends after breakfast. You will be at Vielha with your own car at this point. This holiday features mostly comfortable but some fairly challenging walking, so is suitable for reasonably fit people used to walking for much of a day. On several days there are choices of itineraries, which you can decide for yourselves each day. It can get a little hot in July and August, as well as more crowded. We would recommend June and from mid-August through September as the best months. We will transfer your luggage between each hotel, so all you need to carry when walking is a daysack with whatever you regard as essentials. However, for the night in the refuge you do need to carry whatever washing things, and change of clothes you think necessary - plus a lightweight sleepingbag-liner (blankets provided). This is an independent, self-guided holiday. You stay in double or twin rooms for one night in three star hotel, 3 nights in two star hotels, two nights in particularly good two star hotels, and one night in a comfortable mountain refuge where you sleep in a dormitory with shared bathrooms and hot showers. Usually transfers are in people carriers, mini-buses, cars or taxis. Often they will be exclusively for you. When we have received your balance of payment for your holiday, and in the month before departure, we send you all the documentation you need: detailed itinerary showing dates, times, contact details etc; a detailed guide to your walking route (with options) and lots of cultural, historical and nature background information; formal documents (invoices, contracts etc); luggage labels etc. If you book at the last minute, we can send this information to your first night hotel. Have a look at our detailed explanations on the types of hiking, the standards of accommodation, and understand baggage transport ... How to choose your trip ? A soft travel bag, avoid suitcases, which are more cumbersome and limit the weight of your belongings to 10 kg. A small backpack of 30 litres minimum for your daytime requirements. Sleeping bag liner : your itinerary includes a night in a mountain refuge, then you will need a sleeping bag liner as the refuge will supply sleeping bags and/or blankets. Sleeping bag liners range greatly in size (avoid a "mummy" shape if you are a larger person) and material (from nylon through cotton to silk), so we think it is better for you to buy and bring one that suits you. You need to keep your passport with you at all times, and ideally insurance information. You need to make your own arrangements to claim local healthcare. There are requirements in France and Spain for all vehicles to carry safety equipment. Click on the price that corresponds to your choice. 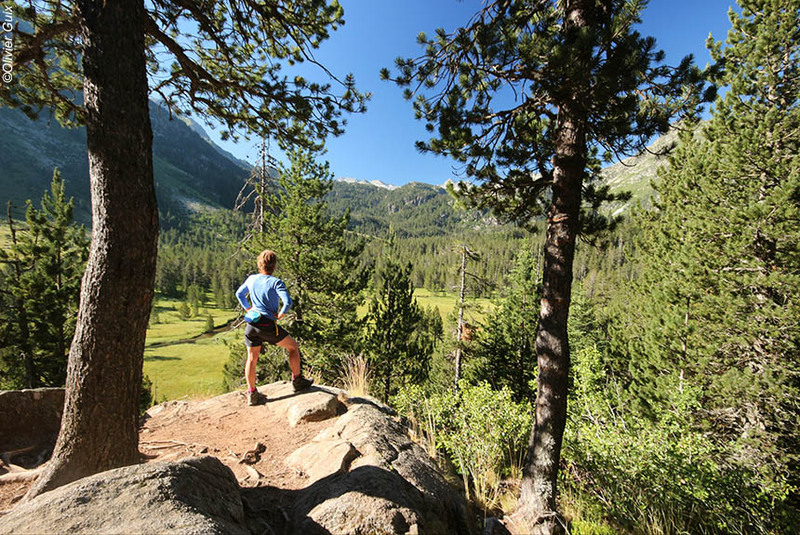 The journey to the start point, and from the finish point, except as specified; lunches except 1 picnic; drinks with meals; non-standard menu items; entry fees; personal and travel insurance. Want to change the itinerary? Complete the form below, and we will send you a revised itinerary as soon as possible. 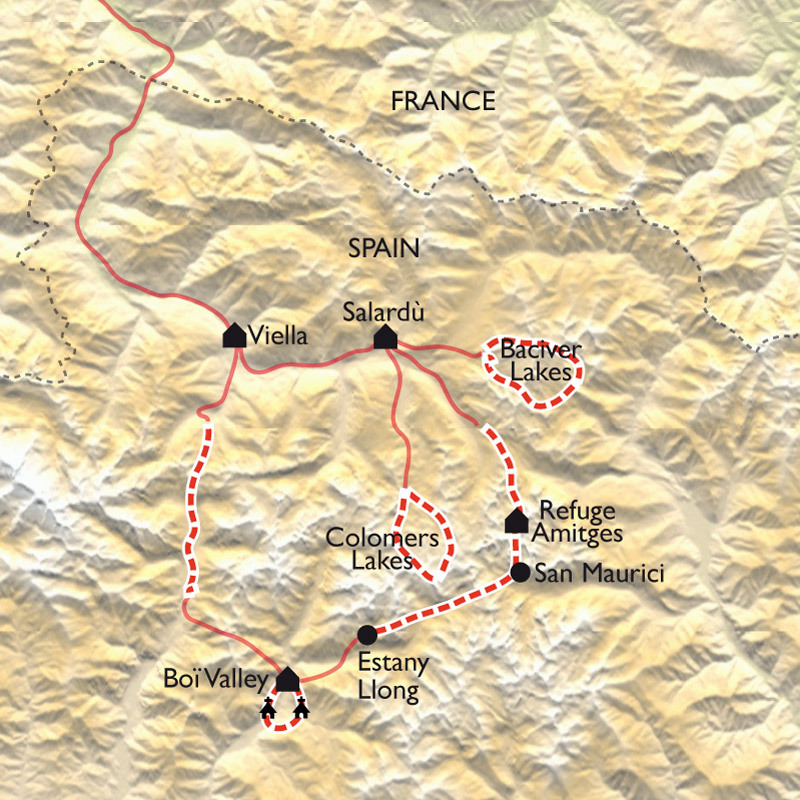 "If you can imagine a harmonious collection of mountains, lakes and valleys, interspersed with lush green meadows, thick forests and crystal clear streams, huge rock walls and beautiful waterfalls, an area with a particular geography and many different microclimates, then you can imagine the National Park of Aiguestortes and the lake Saint Maurice, the Spanish Lakeland." Do you want some advice ? All our walking holidays "Heart of mountains"
Want news about our holidays?